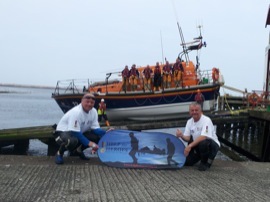 Alistair and John at the end of their Help for Heroes swim from Kelso to Berwick. Well done guys. When they set off at 10am on Saturday 16th June from the Junction hut, they expected to arrive in Berwick around 4pm on Sunday 17th June. However it was not be as the Tweed went into flood and for safety’s sake they had to pull out at Tillmouth and arrange to finish the swim on another day. Today with a weather window, they managed it, well done team, awesome effort. 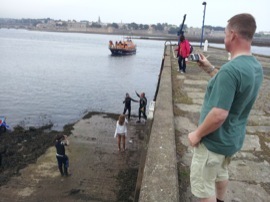 Alistair and John and the crew of the RNLI lifeboat station at Berwick on Tweed who escorted them in. All are welcome to wish us well as we start at Junction and to greet us as we arrive in Berwick on Sunday. We are aiming to raise as much money as we possibly can for Help for Heroes by doing this swim and we are hoping that our many friends and fellow fishermen that we have met and have yet to meet will dig deep and help us in raising money for this great charity. PLEASE DON’T FORGET TO OPT FOR GIFT AID IF YOU CAN, IT DOES MAKE A DIFFERENCE TO THE TOTAL RAISED. This entry was posted in Uncategorized and tagged boatmen, FishTweed, Help for Heroes, River Tweed, Tillmouth, Tweed, Tweed Valley, TweedSwim. Bookmark the permalink.